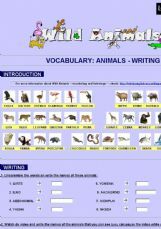 Wild Animals - Vocabulary is the first of a group of activities to practice different vocabulary about wild animals. This exercise let you learn the names of wild animals with writing activities. The previous part has got reading activities. Following exercises in this series are: 2. Wild Animals - Body Parts, 3. Wild Animals - Food & Habitat, 4. Wild Animals - Abilities.